Very talented wrestler from the Monterrey area. Began his career teaming with his younger brother as Los Caifánes Rockeros and immediately impressed everyone from the live crowds to the crowds watching Arena Coliseo de Monterrey TV on the internet to the promoters. The team was even compared to Los Gringos Locos and began using their old superplex/frog splash to finish matches. They eventually began a feud with Los Orientales which led to many great tag team and trios matches. The peak of the feud occurred on July 8, 2001 at Arena Coliseo de Monterrey as the teams faced off in an epic masks vs hairs match where the rudos ended up bald. The match got tons of praise locally, in some national magazines and in various tape trading circles. The teams would continue their feud for many years to follow with a twist being added as Los Caifanes became the tecnicos and Los Orientales were the rudos. During that time period a new Caifán made his debut but it was short-lived. 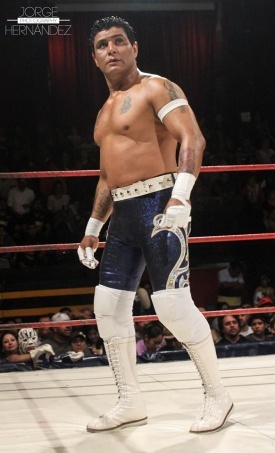 Things changed for the team in 2006 when Caifán Rockero II announced he was leaving professional wrestling. This left his big brother all on his own and he began wrestling under the name Caifán. He spent another couple of years working primarily in Monterrey until the long awaited call from CMLL came. Caifán was headed to Distrito Federal! He worked two trios matches at Arena Coliseo to mixed reviews amongst the fans but he must have impressed the bookers who immediately decided to re-gimmick him as El Brujo. Unfortunately the gimmick change never officially took place as Caifán injured himself seriously after returning home to work a local show. The injury was going to keep him out of action for at least 6 months so the Brujo gimmick was dropped and his spot in the Gran Alternativa as Villano V's partner was taken by Puma King. Caifán has since recovered from the injury and has returned to the ring but has yet to be offered another chance in CMLL. (1) Three Way Match w/Estrella Dorada Jr. This page was last edited on 3 March 2019, at 01:45.